Welcome to the first installment of Homegrown Guild, Chachi Bobinks’s new column about family-friendly gaming. 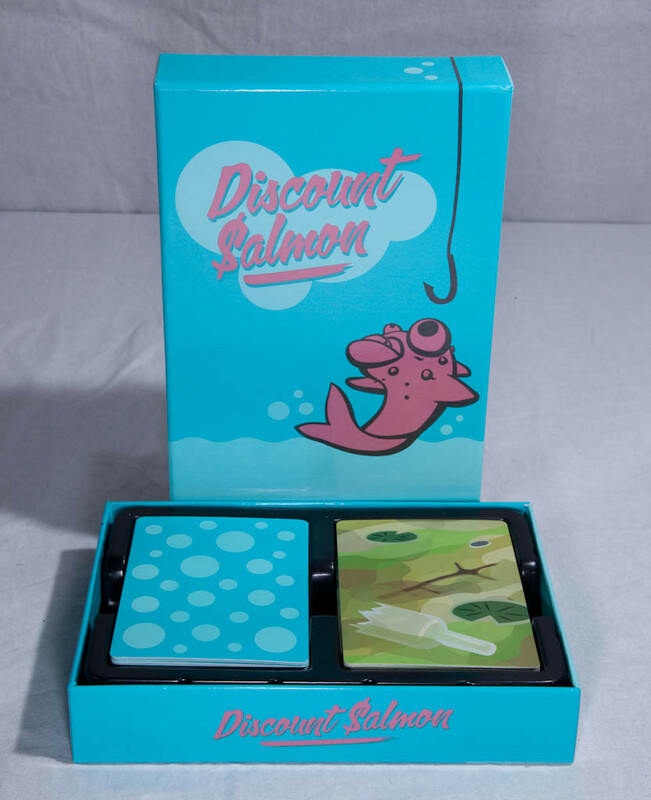 This month she takes a look at Discount Salmon, an all-ages card game. Sometimes the only thing I want in life is a fun game I can play with my kids. It’s relatively easy for me to find something that I enjoy—I love tabletop, mobile games, RPGs, puzzle platformers, card games, and pretty much anything else that moves. But my flavor of game is decidedly not kid-friendly. I can either spend my days whining over the fact that BioWare hasn’t yet come up with Lego: Mass Effect yet or I can spend all my free time at conventions playtesting everything I can, asking questions to game developers, and (sometimes) bringing something home. That’s how I came across Discount Salmon. I picked this game up at PAXPrime 2015, where the AdMagic booth (producer of card games such as Cards Against Humanity, Poop! The Game, and Exploding Kittens) allowed Water Bear Games co-designer Marcus Ross to demo his game. Ross promised me that the game encompassed most ages, but may require slower game play if played with the 8 and under crowd. Honestly, this game had promise from the get-go. Back in September of 2012, Ross and his cousin, artist Cara Heacock, kicked off game development on Omaha’s Startup Weekend. They created their game within 48 hours and placed fifth overall. Not even a year later, the team entered Discount Salmon into Cards Against Humanity’s Tabletop Deathmatch. And won. But little did they know that all of that past success meant nothing, as they still had one great obstacle to overcome: the approval of my children. I recently sat down with my little ones (ages four and thirteen) and an eight year-old friend to give the game a shot. One of the first things we appreciated about Discount Salmon was that absolutely no reading was required for the playing of the game. 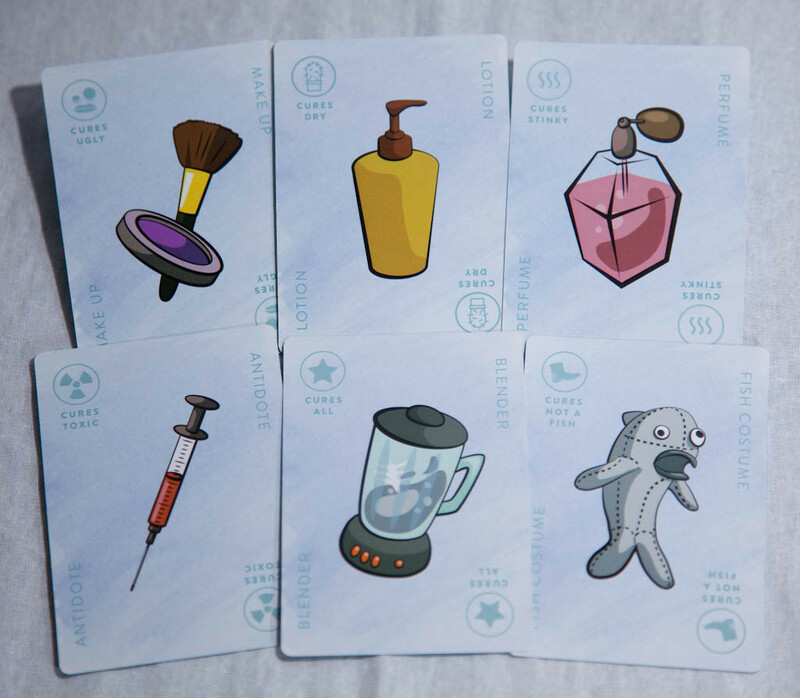 The pictures on each card, from the Fish Decoy to the Antidote, are descriptive enough to speak on their own. The game is won almost entirely by speed, so it was nice to see that the inability to read wouldn’t be a hard stop. The cards are color-coded by category, but knowing what the colors meant didn’t affect gameplay at all, either. Each card also has smaller symbols along the left side that provide guidance as to which cards could be stacked on it, which helped to eliminate up-front confusion. Best of all, the card quality is fantastic. This meant that when my youngest got frustrated and pitched them all down, nothing got bent. Eight years old ended up being the perfect starter age. We assumed the role of toxic lake fish monger and started our game. 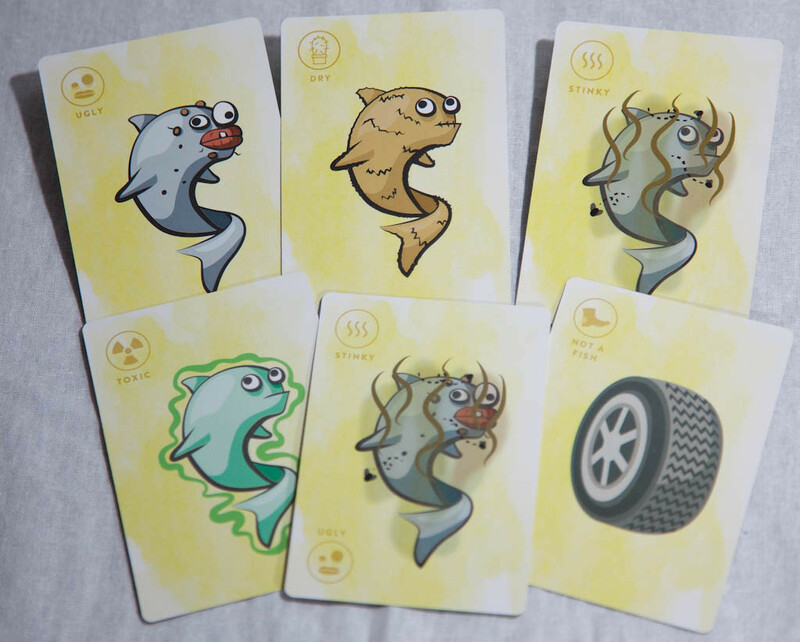 A quick runthrough of how gameplay works: a card featuring an afflicted fish is thrown down (Ugly, Toxic, and Not a Fish are some of the cards included) and players race to make the fish sellable, with fixes like Make-Up and Lotion. An almost perfect fish can also be further jeopardized by other players too, with cards like Nuclear Waste and Mustache at hand. The goal is to fix the fish and points are given to whomever lays down the last card. Honestly, the game is just good fun. I’d definitely consider Discount Salmon to be more of an appetizer, as it’s quick to learn and even faster to finish, with each of our rounds lasting 8-12 minutes. Creativity came into play quickly. It was fun to see the kids light up when they realized that they had just the right cards at hand to really mess each other up. And naturally, they finally got to where they could beat the snot out of me. Because of course they did. The game is definitely simplistic in nature, but grows more complicated the faster you go and the better you know it. We did eventually put the game aside for something more challenging, but I didn’t see it as a sign of dissatisfaction. I’ll keep my fingers crossed for future expansions that could reduce the amount of card repeats. When it comes to our kid-friendly rating, this game achieved only 1 Rage-Quit out of a possible 4. The only feedback we wanted to provide was a want for a longer game and a desire for more card options. I found it to be appropriate both in content and player age consideration. Any parent who would like to introduce their children to dexterity card games would find a winner in Discount Salmon. I give it a Thumbs Up for Mom Approval.